As football season arrives, Summit’s in Snellville is one of the better football options because of the beer, the food, the screens. Summits will put every NFL game up on Sundays. Their menus are seasonal, a base menu plus extras for the occasion, and as we’re smack in the middle of October, Oktoberfest options are available currently. This is not the only eatery with Oktoberfest options in the region. Red Robin, in the Shoppes (formerly the Avenue) has an Oktoberfest burger, if you like that kind of thing. But Summit’s tends to provide both unique beers this time of year (for example, a plentiful supply of German wheat, or wit, beers), food options you don’t get any other time (a lot of sausage, or brat, options), on top of the seasonal football. One thing I didn’t know they provided were beer flights. 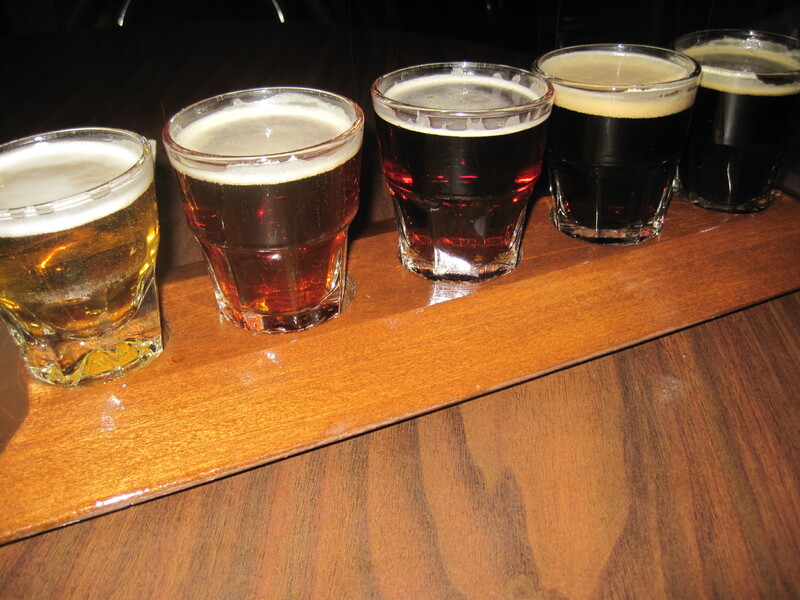 This is a pre-selected set of 5 or 6 beers, starting around 10 dollars, that present a range of options to the drinker. The serving size is usually smaller, about half a normal serving per beer. Summit’s has three beer flights at this time, a light to dark flight ($10), an IPA flight ($15), and a high gravity beer (high alcohol content) flight ($25). In the photo above is the light to dark flight, which I had while watching football one Saturday. I recommend this flight. It’s not expensive, in bar terms, for the beers you get. The taste and flavor contrasts are worth the trouble.